Foxy arboriculture was founded by arborist, Michael Riddy, who has over eight years experience specializing in all aspects of tree surgery. Our family run company is based in South East London, covering all areas of London and surrounding counties within the M25 area. We are a relatively small company but never shy away from large jobs. 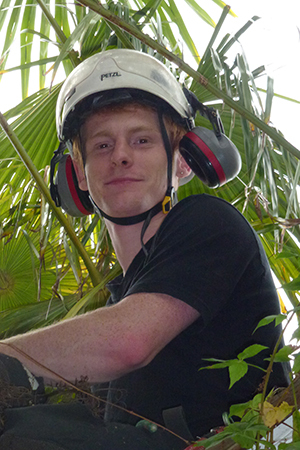 Our staff have extensive experience working on large trees and can tackle any job with ease – they are all NPTC qualified, insured, hardworking, friendly and always considerate. I have always had a passion for trees, wide life and love the freedom of climbing in trees. I completed a two year BTEC National Diploma in Forestry and Arboriculture and the basic NPTC at Merrist Woods, Guilford College. Subsequently, I was employed by one of the largest companies in the UK and worked all over London including the Boroughs of Chelsea, Lambeth, Wandsworth, Camden and Islington councils, The Royal Parks & The Mall, various private contracts & domestic work. Ongoing self development and training has always been of the highest priority and following the British Standards for Tree Work BS3998. I have worked closely with Local Authority tree officers and have received past letters of praise. I am environmentally conscious, will always try to preserve trees where possible and have created this ethos within my company. Please refer to the pest and diseases section on the site for information on local epidemics and outbreaks of various fungi and insects in London.